During the heyday of Mystic’s shipbuilding activity in the 1850s and for a generation thereafter, the Greenmanville Seventh Day Baptist Church was the focus of the town’s considerable Seventh Day Baptist community. The congregation, which was an offshoot of the Greenman brothers’ own home parish in Westerly, Rhode Island, built the church about 1851 (the original site is adjacent to the present main entrance to Mystic Seaport) largely through the support of the Greenman and Fish shipbuilding families. Unlike the occasional role played by the Fishtown Chapel, regular worship services were held here, with the three Greenman brothers in regular attendance. In accordance with Seventh Day Baptist custom, the Greenman shipyard and textile mill were closed on Saturday (the work week was Sunday through Friday). Worship services were held each Saturday when most of the other Mystic shipyards were in full operation. At least once the neighboring Mallory shipyard, run by Congregationalists who celebrated the Sabbath on Sunday, launched a newly built ship on a Saturday, while the Greenmanville Church was in progress. The excitement of the event interrupted the pastor’s sermon in mid-sentence, and, it is said, the congregation climbed onto the pews for a better view of the launching ways, cheering in unison when the climactic moment came. The service then resumed, no doubt in some disarray. With the decline of the shipyard during the 1870s and 1880s, the congregation was depleted and the church was finally closed in 1904. 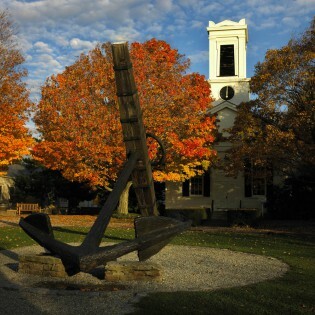 After passing from hand to hand as a private residence and apartment building, the old church was acquired by Mystic Seaport in 1955. Through the generous benefaction of the Arthur Curtiss James Foundation, the Museum was able to move the building to its present site and undertake its thorough restoration. The tower clock in the steeple was added after the Meeting House was acquired by the Museum. Built in 1857 by the Howard Clock Company of Waltham, Massachusetts, the clock is on permanent loan from Yale University, where it was located in the Old South Sheffield Hall of the Sheffield Scientific School. The elaborate works may be viewed from inside the building.